Thankfully there are people out there who understand about the obsessive nature of fans-people like me. I have several book related obsessions, but I can name them on one hand: Harry Potter, Piglet from Winnie the Pooh, the Wizard of Oz and Stephen King. Now Stephen King and I go way back. I was twelve when I read Skeleton Crew for the first time. My cousin had given me a box of books filled with Dean Koontz, a lot of John Saul and quite a few by Stephen King. I can still digging through that box of books that smelled of age and mildew. I came to one that had a grinning monkey on the cover, clashing cymbals. 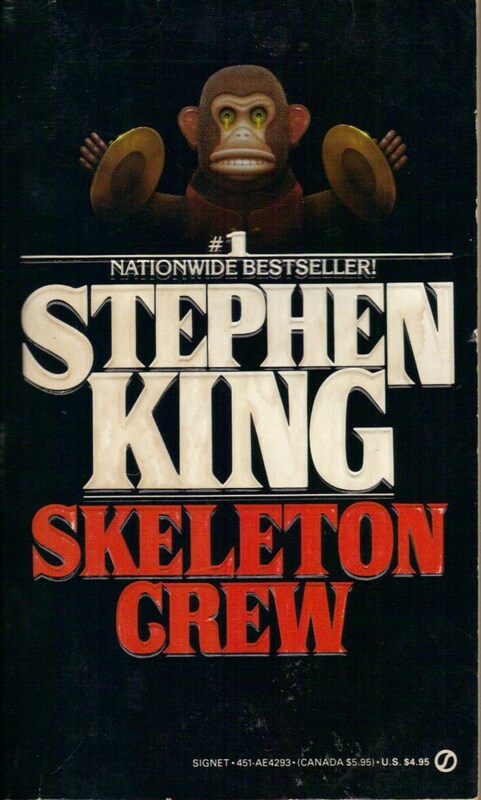 I still remember reading Skeleton Crew for a whole afternoon in my aunt’s garage. I was held spellbound. I made it through three stories in one gulp: The Mist, Here There Be Tygers and The Monkey. No one ever forgets their first time, when they discover an amazing writers books that change their life forever. It was like that for me with Stephen King-here was a writer who got it. I’ve since read everything of King’s that I can get my hands on. 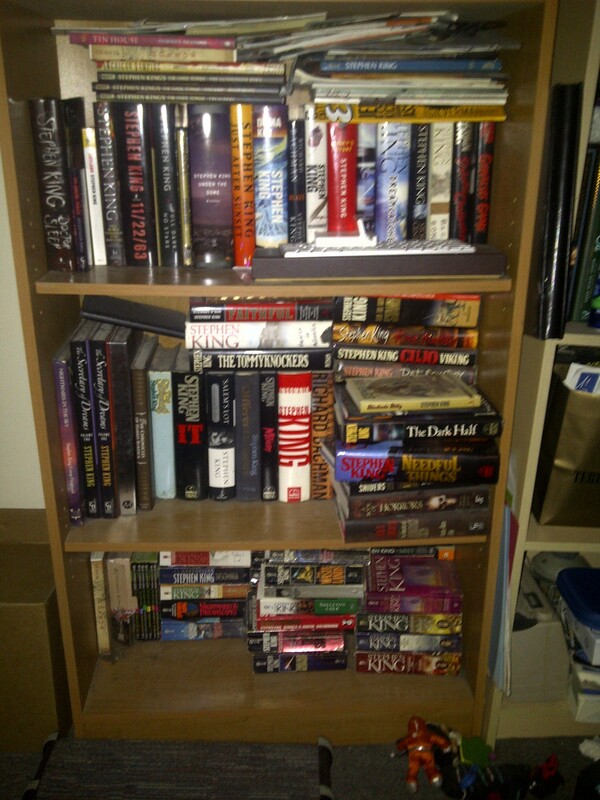 Here’s my Stephen King bookshelf. It’s filled with his novels (my pride and joy an original 1st edition of The Shinning. A little beat up, but still! ), his comics (American Vampire and The Dark Tower) and his short stories that appear in magazines. I’ve also collected books about King which is what led me to Cemetery Dance. I’ve since gotten a subscription to their magazine as well as some other volumes: Blockade Billy and The Dark Man by King himself. And Lilja’s Library: The World of Stephen King by Hans-Ake Lilja and several non-fiction books by Kevin Quigley. So I was thrilled when the publication of The Illustrated Stephen King Trivia Book by Brian James Freeman and Bev Vincent (two of my other favorite authors) and The Illustrated Stephen King Movie Trivia Book by Brian James Freeman, Hans-Ake Lilja and Kevin Quigley were announced. I’d never seen the like. Both volumes are illustrated by the amazing Glenn Chadbourne. I am in awe of his art and illustration. The drawings in The Dark Man were incredible and I have long yearned for one of his pieces. When the books arrived, I was astounded by their size. I was lucky enough to get advance readers copies. They were huge! They’re over 400 pages of awesome trivia related to Stephen King and are simply wonderful for the sheer breadth of questions. I was happy with my score but shocked by how many I got wrong! I was astounded by the minute detail that the questions got into. I also love what they’ve done in that the movies and the books are mostly separate. Some people know King from watching The Shinning, Carrie, Children of the Corn, PetCemetery or The Dark Half. Some of us know him from reading him. The Stephen King Trivia Book by Brian James Freeman and Bev Vincent focuses on a variety of all things King including questions about all of his novels, novellas, short stories, the Bachman books, the Dark Tower Series, non fiction; there is even chapters about King himself and a stunning introduction by Bev Vincent. 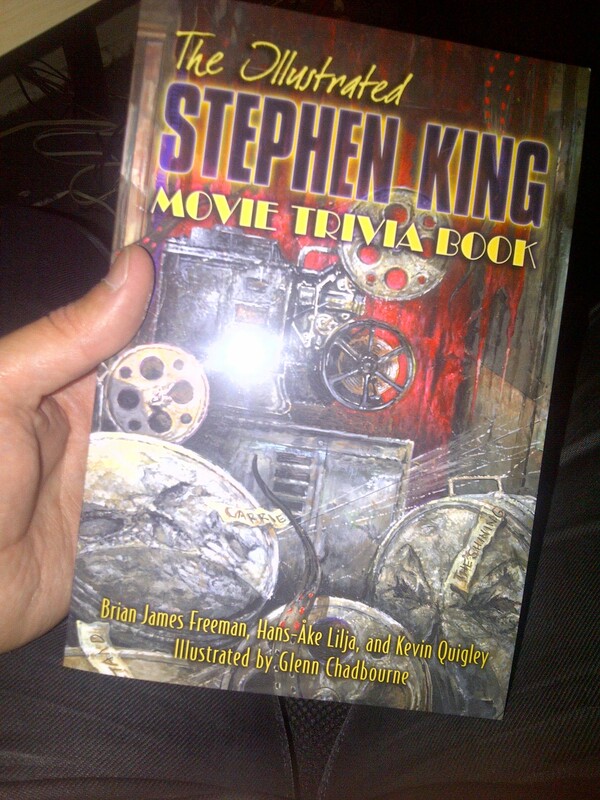 The Illustrated Stephen King Movie Trivia Book by Brian James Freeman, Hans-Ake Lilja and Kevin Quigley was likewise mind blowing. It covers questions about all of the Stephen King adaptations that have been done from 1976 to 2011. That’s a lot of movies and television viewing. 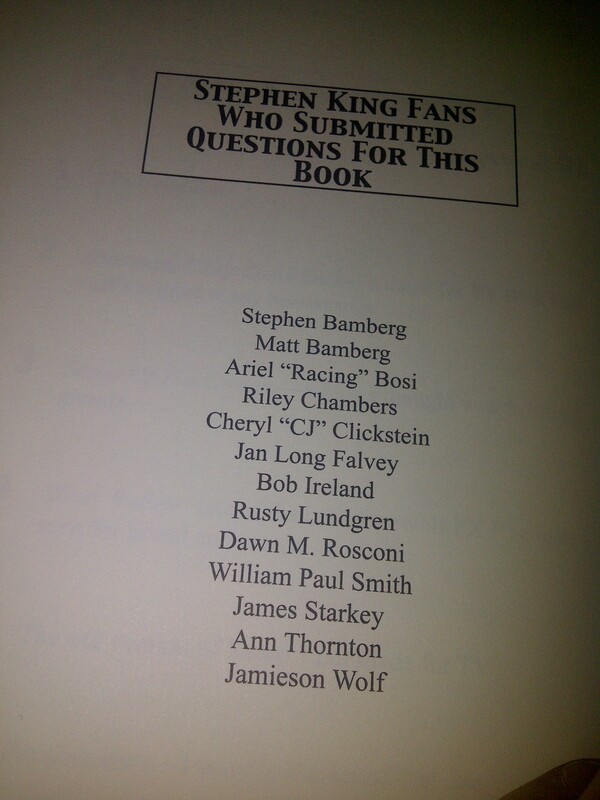 And check it out: my name is in the back of the book! A year or two back, fans had the opportunity to submit questions that may appear in the book! I have no idea which of mine were included but I submitted a lot. Both of these books are incredible because they helped me remember moments that are caught in time thanks to Stephen King in one way or another. The first time I read Skeleton Crew or watched Carrie and read the book. Certain moments in The Dark Tower Series or The Shinning. The countless hours I have spent reading or watching King and being constantly entertained. That’s the best way I can describe it, but why listen to me? Get yourself a copy of each from Cemetery Dance, the books could make a great party game idea for Halloween amongst like minded King fans. Could be cool right? ← Why a serial novel?